MEMORY CRAFT 11000 SPECIAL EDITION Compact Footprint and Practical Weight Remarkably Complete, yet Remarkably Compact. 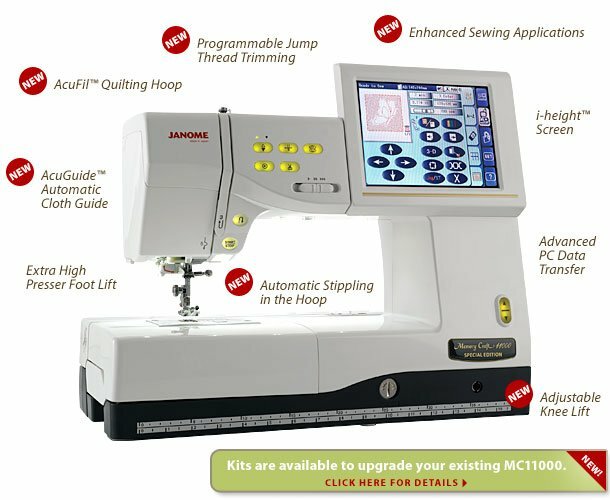 The Memory Craft 11000 Special Edition sews, embroiders and quilts with a precision and innovation you won't find on any other top-of-the-line machine. With the i-height touch screen in the up position, you get 9.2" (234 mm) of workspace to the right of the needle. Yet the machine's footprint is just 18.5" (469 mm) and its weight just 32 lbs (14.3kg). Stipple In The Hoop And Across Your Entire Quilt One of the machine's most exciting features for quilters is the new AcuFil Quilting System. First, you get the ease and control of stippling your quilt in an embroidery hoop. And, because it is so accurate, you can continue this stippling to perfectly cover your entire quilt -- up to 10' by 10' (3 x 3 m). Your friends will think you used a long-arm machine. Janome Precision Without The Need For A Bulky Embroidery Attachment Our Rolling Linear Guide embroidery mechanism utilizes technology developed for high-precision industrial robots. The result is absolutely stunning embroidery. You can do it all without ever having to wrestle with a bulky embroidery attachment. The Easier The Tools, The More Creative You Become This machine can pull designs from your PC and save designs to your PC. It has an automatic jump thread trimmer that lets you choose the length of stitch to trim essential for satin stitching and lettering. And there's a new AcuGuide Automatic Cloth Guide to make hemming, lines of decorative stitching, and perfect rows and seams a breeze. Built-in Hand Look Stitches and AcuFil Quilting Designs With more decorative stitches and built-in embroidery designs, you'll never run out of options to express your creativity.